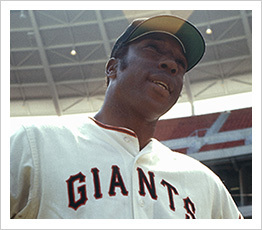 Willie McCovey, one of the most enthusiastic players at the 1973 winter drills, made a special trip to the Giants’ front office in January to sign his 1973 contract long before anyone else did. He arrived at Candlestick Stadium ready and eager for his 15 major league season and immediately began pummeling the seats that remained in short left field from the 49ers’ football campaign. After he broken a few with his awesome left-handed stroke, they were removed by the grounds crew.